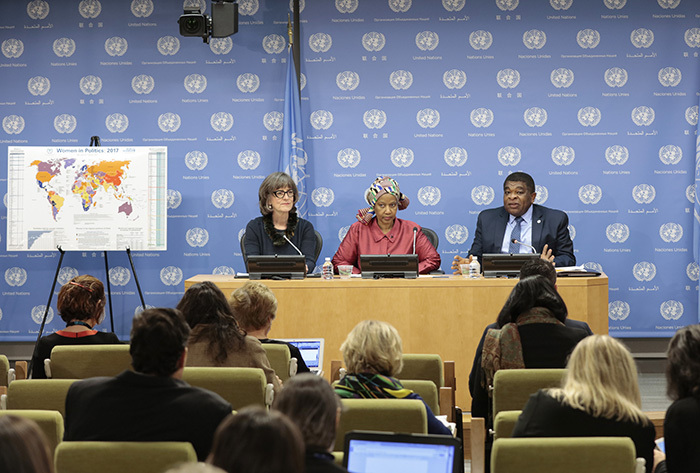 United Nations, New York, USA, 15 March 2017 – Phumzile Mlambo-Ngcuka, Executive Director, UN Women, Martin Chungong, Secretary General, IPU and Paddy Torsney Participated at the Press Briefing on the 2017 World Map of Women in Power today at the UN Headquarters in New York. IPU Secretary-General Martin Chungong said despite some gains in women’s representation, the setbacks showed that this could not be taken for granted if more robust measures were not taken to maintain the momentum. He said the countries that were doing well are the “younger democracies” in Latin America and Africa, while some European countries and the United States were “not doing that well.” He said something needed to be done to “rethink democracy.” Chungong stressed that ruling parties and opposition parties alike had the responsibility to promote gender equality in politics. Data from the map showed that the global average of women in national parliaments increased just slightly from 22.6 per cent in 2015 to 23.3 per cent in 2016. Rwanda, Bolivia, Cuba, Iceland, and Nicaragua rounded out the top five countries with the highest percentage of women parliamentarians while the United States ranked 104th. Bulgaria, France, Nicaragua, Sweden and Canada have surpassed the 50 percent mark of women in ministerial positions which could largely attributed to a clear political commitment at the highest decision-making level as well as a genuinely gender-sensitive political culture.